PASADENA, California, October 14, 2014 (ENS) – A 60-foot-long articulated bus scheduled for roll-out in mid-2015 will be the first in North America to be powered by a hydrogen fuel cell/battery combination electric drive. CALSTART, a U.S. nonprofit clean transport consortium of 150 member companies, Monday announced that it has received approval from the U.S. Federal Transit Administration (FTA) to develop the zero emission electric bus. The propulsion system will include a combination of batteries, a next-generation hydrogen fuel cell, and hydrogen storage. The electric drive bus will allow the fuel cell to operate at a relative steady-state, while the batteries will be able to capture braking energy and provide power for acceleration. The project aims to improve durability and lower costs of heavy-duty transit buses, to approach the goal of pollution-free mass transit. “This is a major milestone in the zero emission bus sector. Sixty-foot buses serve the most densely populated corridors where air quality is very important. It is only through technology advancement that we are now able to envision buses of this size operating without emissions,” said CALSTART President and CEO John Boesel from the consortium’s headquarters in Pasadena. CALSTART is managing the project for the Federal Transit Administration. Funding came in part from the FTA’s National Fuel Cell Bus Program. “The FTA investment is in this project was critical and is a good example of how a small amount of public capital can spur innovation,” Boesel said. CALSTART says the fuel cell/battery bus will meet the Federal Transit Administration’s Buy-America requirements although the bus manufacturer and the fuel cell supplier are both Canadian, and the electric powertrain manufacturer is German. New Flyer Industries of Winnipeg, Manitoba is teaming with the fuel cell supplier, Ballard Power Systems of Vancouver, British Columbia, and Siemens, the electric powertrain manufacturer, to build, test and deliver the bus. New Flyer will build the bus using a unique combination of a fuel cell and batteries. New Flyer plans to put the bus into commercial production. “Over the next decade, we expect to see a transition from conventional propulsion towards zero emission technologies in the heavy duty transit market in North America,” said Paul Soubry, president and CEO of New Flyer, Winnipeg, Manitoba. Ballard received a purchase order from New Flyer Industries in July for the delivery of its next-generation FCvelocity®-HD7 fuel cell power module. Delivery of the power module to New Flyer Industries is planned for later this year. 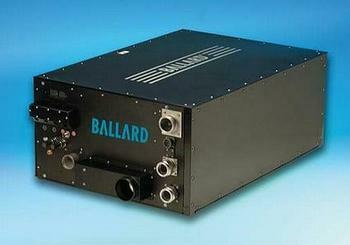 Ballard’s FCvelocity-HD7 fuel cell power module is lower in cost, smaller and lighter than existing models. With its integrated air compressor and coolant pump, Ballard says the new power module has fewer moving parts and fewer parts overall. The FCvelocity-HD7 features fuel cell stacks manufactured using Ballard’s high-volume manufacturing processes. Ballard has a long history of working with New Flyer Industries, having powered fuel cell buses in Vancouver, Chicago and the Palm Springs region dating back to the first ever prototype fuel cell bus in 1991. 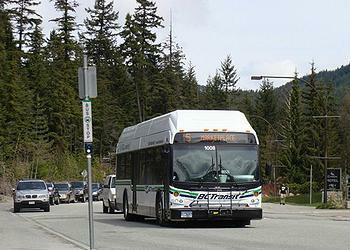 More recently, Ballard and New Flyer Industries partnered on the successful operation of BC Transit’s fuel cell demonstration fleet of 20 buses, which ran from 2009 to 2014 in Whistler, British Columbia, accumulating nearly four million kilometers (2.5 million miles) in revenue service. Scheduled for completion in the middle of next year, the new battery/fuel cell bus will be sent to Altoona, Pennsylvania for testing and qualification under the U.S. Federal Transit Administration’s National Fuel Cell Bus Program. A key step in the commercialization of the bus will be to complete a full Altoona Durability and Performance test, part of the FTA’s Bus Testing Program. Then the bus will be deployed to Connecticut Transit (CTTransit) for 22 months of in-revenue service operations in and around the greater Hartford area. Hartford, Connecticut eventually will host New England’s first zero-emission fuel cell hybrid bus fleet.